This game is Fire Emblem meets Persona/SMT with energetic turn-based combat. 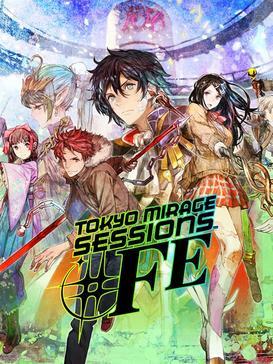 "Tokyo Mirage Sessions â™¯FE is set in modern-day Tokyo, with real-life locations such as Shibuya and Harajuku being featured. Tokyo has become beset by attacks from an alternate dimension called the Idolosphere, with beings known as Mirages harvesting an energy called Performa from humans. The story focuses on a group of young people who become allied with friendly Mirages by chance, and are recruited by Fortuna Entertainment: while outwardly a talent agency, Fortuna is dedicated to preventing invasions from the Idolosphere." Releases this June on Wii U. Interesting to note is that it will not contain an English dub, but retain the Japanese voice-overs with English subtitles, due to its 'strong Japanese influence/setting'. Or more likely, to save money in the localization process. I feel you on that, aside from lately when I bought all the Persona games at once (I did the same thing with Resident Evil a couple years ago), I tend to go one game at a time, and try to limit myself to buying once a month. I may make this a priority though since it feels so niche, it might become extremely hard to find too long after release. And thus continues the idiocy parade that is Nintendo of America, time to burn down the Treehouse. Bravely Second, FE Fates, and now this, what stupid move are they gonna make next. And thus continues the idiocy parade that is Nintendo of America. Bravely Second, FE Fates, and now this, what stupid move are they gonna make next. This may shock you, but Nintendo has always localized like this. Like, for decades. And lord, these changes aren't even a big deal. Oh yeah? Did the game do particularly well in Japan? The game actually did OK in Japan. While it never truly hit the top 5 sales positions, the game had a good sell-through rate. The game has dropped off the rankings since late February. That's why I said the idiocy parade continues. Words. "I don't care about censorship as long as it doesn't affect me." There'll be more and worse censors, and by the time you actually give a damn about how terrible censorship is, it'll be too late. Anyway... I'm still interested in the game. I don't know how I'll feel about a sequel (do we think it'd be for the WiiU or the NX) until I see if I like the game proper, but I'm intrigued. Dude, I really don't care enough about your opinion on this topic to actually bother arguing specifics about it or detailing my own stance on these issues at this time. Hence why I dropped the subject and brought it back to simply looking forward to the game. ...Anyways, I'm surprised this is even getting a sequel, seeing as how it wasn't much of a cash cow in terms of sales. But a product doesn't need to do exceptionally well to warrant a sequel, so I'm not that surprised either. And if a sequel does come out, it'll most likely be on the NX, seeing as how the U is pretty much dead at this point, and they're officially unveiling the NX in less than two months, and Nintendo's newest home consoles might hit the shelves during the Holidays of this year. The only reason I thought it might be for Wii U was just that it would likely be more cost effective. They already have the engine, the battle system, assets, etc for the WiiU. It'd likely be easier, quicker and cheaper to make a sequel for the WiiU than to make a brand new game for the NX. But you're right, that the NX is coming too soon for that to work. Even a quick turn around on development would be like two years... Idk, at first blush it seems like it might be possible as a "one of the last WiiU titles" kind of release, but yeah, if it is a sequel it'd probably be for the NX at this point. I was gonna suggest a port a la Zelda U on the NX, but that might also be some extra work/cost. Eeh, Zelda U will come out for the NX, too. So it'll pretty much be a slight breather for the dead console. Yeah, I'm seeing it'll very much be a Twilight Princess situation. In any case, I'm sure E3 might shed some light on Zelda U (at least it honestly needs to), and potentially this sequel if it's being talked about already. This game was in the E3 direct last year, so it's possible. For the sequel, I'd love to see a dub (or at least dual audio which is surprising to not be the standard), since Atlus dubs have been amazing in the past decade. Atlus is doing the localization + translation for TMS#FE and not Nintendo. Thank God. Surely done to make up for its recent localization mishaps. NoA still will have final say as a publisher always does, but this is a step in the right direction. Also, definitely cancelling my normal pre-order for that special edition as soon as it's up on Amazon.